I have been holding off writing about the hand-made Christmas Gifts we made this year because Granny (Gordon’s mum) was away for Christmas and in our usual disorganised way we hadn’t finished most of the gifts before she went! She is back home now and we are going to visit tomorrow so finally she will get her Christmas gifts and I can write the first post! One of the things I really started to enjoy last year was sewing. I have never really done any needlework in the past but my Hama Bead obsession led to me trying out Cross Stitch (they are both about counting patterns and colours!) and from there I gained confidence with a needle and began making some simple items. 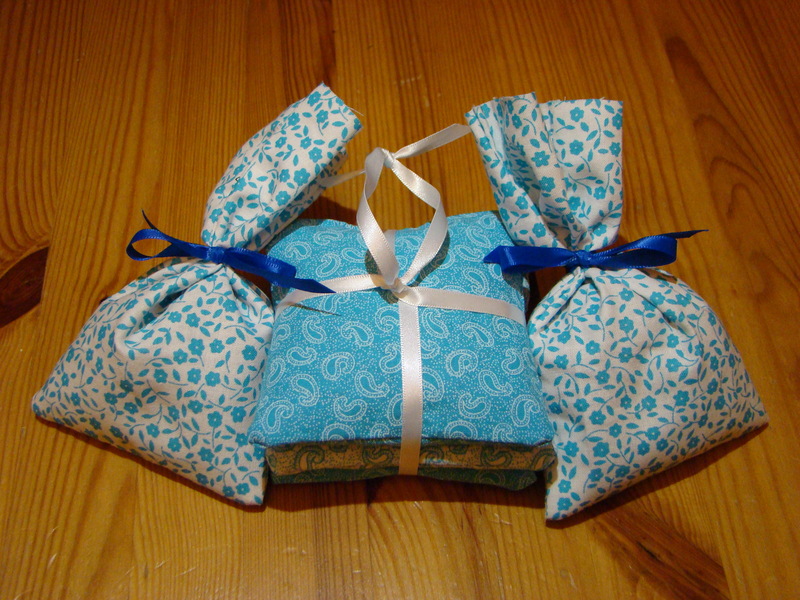 One of the first hand-made gifts I decided to make for Christmas was lavender bags and satchets. I began by cutting 2 pieces of fabric 18cm x 15cm. With right sides of the fabric facing, pin together. The pattern I was following said this included a 1cm seam allowance so, being a beginner, I marked a 1cm border along 2 long sides and 1 short side and used this line as a guide for the stitching. For the first bags I made I hand stitched in backstitch but I have also machine sewn a few now. Once the 3 sides are sewn turn the bag inside out and push the corners out with a blunt pencil or similar. Hem the top opening. The pattern said to either hemstitch or blindstitch. I had to google both and found a great tutorial on YouTube for blindstitch so used this. I was surprised by how easy it actually was once I knew how! I then filled the bag approximately 2/3rds full of lavender (purchased from Ebay) and tied it tightly shut with a 30cm length of ribbon. I also made some lavender drawer sachets using 15cm square pieces of fabric and leaving a 2cm hole in one side to turn out and fill. Once filled I sewed the hole up and completed the gift by tying 3 together with ribbon. One of my favourite books of 2012 was The Complete Book of Preserves & Pickles by Catherine Atkinson and Maggie Mayhew. 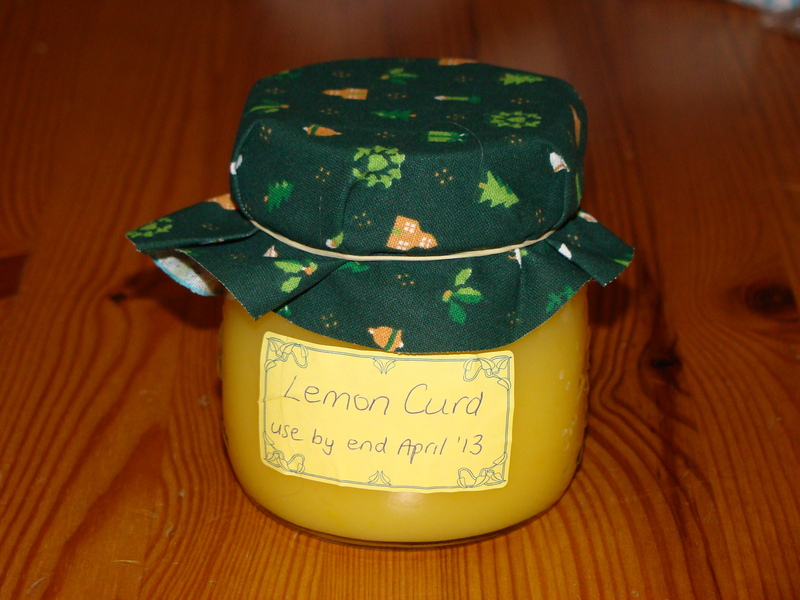 I used it a lot over the year and one of my very favourite recipes is Lemon Curd. It takes only 4 ingredients and can be made from start to finish in less then an hour. It is a perfect hand-made gift idea. Wash the lemons, the finely grate the rind and place in a large heatproof bowl. Halve the lemons and squeeze the juice into the bowl. Set over a pan of gently simmering water and add the sugar and butter. Stir until the sugar has dissolved and the butter melted. Put the eggs and yolks in a bowl and beat together with a fork. Pour the eggs through a sieve into the lemon mixture and whisk well until thoroughly combined. Stir the mixture constantly over the heat until the lemon curd thickens and coats the back of a wooden spoon. Remove and pour into small warm sterilised jars. Cover, seal and label. Store in a cool, dark place for up to 3 months. Once opened keep in the fridge.